During the Tokyo Game Show, Hideo Kojima was asked about Metal Gear Survive. He wasn’t rude per se, but honest. Official footage of the incident, however, seems to be vanishing, causing all sorts of wild speculation on major Japanese game sites. The event was held on September 18 at the Sony booth. A massive audience showed up, and Kojima answered fan questions. 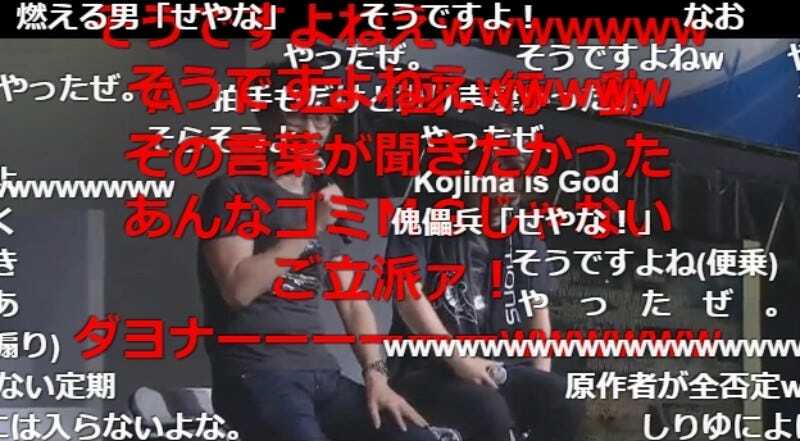 The press conference was streamed on Nico Nico Douga, and when Kojima gave his two cents on Metal Gear Survive and zombies, the real-time streaming comments went nuts. However, according to Hachima Kikou, one of the country’s most popular game blogs, the timeshift function that allows you to view clips later is ending for this particular event. The underlined Nico Nico text in this screengrab reads that the time shift ended on October 3 “due to various circumstances.” That bit of text appears to have vanished. Hrm. The official PlayStation YouTube also streamed the event, but that footage seems to have been removed from the official PlayStation YouTube account. Here’s where it gets even stranger. As My Game News Flash, another popular Japanese game site, points out, the official Japanese PlayStation Blog has all the stage event clips up, except for the Kojima Productions one. The text with the asterisk reads that the open-to-the-public period for this content has ended. None of the other clips showing stage events were taken down. Only the Kojima one, which should be in the middle of the below image. Ripped clips currently remain on YouTube and footage people shot can still be viewed on Twitter, but via official means is another story. There are a whole host of internet theories why the footage has been removed from these sources. For Konami, having the guy who created Metal Gear say these kind of things doesn’t exactly help Survive sales. I could see how having that up on an official Sony source would cause consternation. But again, we don’t know why this footage is being removed. Kotaku has reached out out to Nico Nico, Sony, and Konami, but haven’t heard back in time for publication.